The Newtown and Machynlleth Railway, North Wales. The Opening Ceremony at Machynlleth. An antique woodcut engraving which was published in "The Illustrated London News" on January 24th, 1863, with later hand colouring. The full page also contains a report of the event and a further woodcut engraving of the 'Talerddig Cutting'. The Forth Bridge at Queensferry, on the North British Railway: View from the South Shore. An antique woodcut engraving which was published in "The Illustrated London News' on October 19th, 1889. Centrefold as published. Ballochmyle Viaduct on the Glasgow, Dumphries & Carlisle Railway. John Miller Esq. F.R.S.E. Engineer. Interior of Box Tunnel - J.C. Bourne. An antique lithograph by J C Bourne showing a steam train travelling into the darkness of Box Tunnel between Chippenham and Bath. The tunnel was one of Isambard Kingdom Brunel's major engineering achievements on the Paddington to Bristol line. Construction began in 1838 and it was opened on 30 June 1841. An antique lithograph drawn and lithographed by J C Bourne of the 'Sherbourne Viaduct near Coventry' on the London and Birmingham Railway. Printed by Day and Haghe, Lithographers to the Queen. Published by J C Bourne, 19 Lamb's Conduit Street, and Ackermann and Co, Strand, London. Circa 1838. An antique coloured engraving which was published in a supplement to "The Illustrated London News" on April 23rd, 1859. Depicts William Chaplin's London to Manchester stagecoach Defiance, derelict in a farmyard and surrounded by farm animals. In the background is a new railway station, signals, telegraph, passenger steam train. The West End Railway District, London. An antique woodcut engraving which was published in "The Illustrated London News" on April 9th, 1859. "The locality embraced in the Illustration is that which lies between Vauxhal and Battersea Bridges". Printers creases in topright and bottom right. View of the Manchester & Liverpool Railway taken at Newton. 1825. An antique aquatint engraving by Havell after the drawing by Calvert. The image shows two locomotives with carriages at Newton station on the Manchester - Liverpool line. Circa 1830 with original hand colouring. Shows two trains at thestation, a third in the distance. Some light foxing in margins. Opening of the Swansea and Neath Railway : The first train passing Neath Abbey Station. An antique woodcut engraving which was published in "The Illustrated London News" on August 1st, 1863 with later hand colouring. 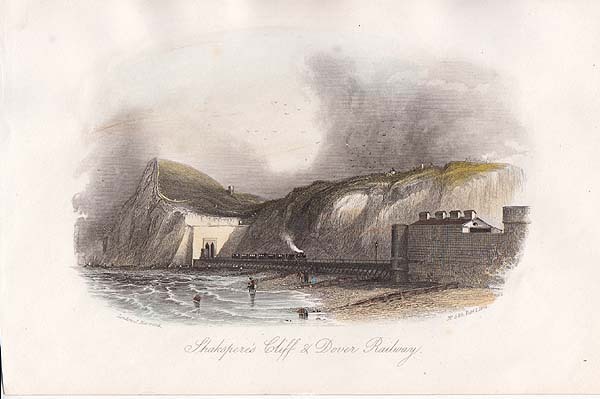 Shakespear's Cliff & Dover Railway. An antique line engraving by J. Harwood. Published February 1st, 1846 with later hand colouring. Old Locomotive Engine, constructed by the late George Stevenson, for Killingworth Colliery. 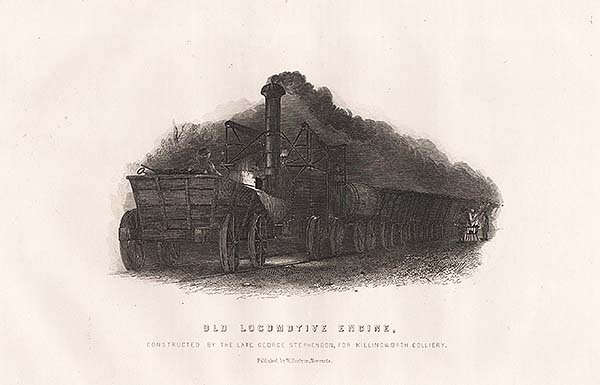 An antique line engraving published in "A History of Coal, Coke and Coal Fields" by W. Fordyce in 1860. Approx 26 cms by 17cms. An antique line engraving by W. Radclyffe after D. Cox. Circa 1860 with later hand colouring. An antique line engraving by W. Radclyffe after T. Creswick. Circa 1860 with later hand colouring. Bridge in the Blisworth Embankment. The Road leading from Towcester to Northampton. An antique line engraving. Circa 1860 with later hand colouring. An antique line engraving by W., Radclyffe after T.Creswick. Circa 1860 with later hand colouring. An antique line engraving published by William S. Orr & Co., 1856 with later hand colouring. An antique line engraving after C. Radclyffe. Circa 1860 with later hand colouring. An antique line engraving by W.Radclyffe. Circa 1860 with later hand colouring. An antique line engraving by E. Radclyffe after George Dodgson. Published in T Roscoe's History of the London & Birmingham Railway in 1845 with later hand colouring. An antique line engraving which was engraved and published by Newman & Co. 48, Watling St. London. Circa 1860 with later hand colouring. All margins trimmed. An antique line engraving by W. Radclyffe after L. Wrightson. Circa 1830 with later hand colouring. Newton Road Station, near Birmingham. An antique line engraving by W. Radclyffe after C. Radclyffe. Published in 1839 with later hand colouring. Reception of a Monster Railway Bar at Port Talbot, Glamorganshire. An antique woodcut engraving which was published in "The Illustrated London News" on February 22nd, 1851 with later hand colouring. More Info An antique lithograph of Knaresborough Viaduct over the River Nidd which was completed in 1851 and built through the picturesque town to carry a branch of the Leeds & Thirsk Railway. The four-span bridge stands 78ft high above the water, each span measuring 56ft 9in across. Circa 1851. Artist and lithographer are unknown. An antique lithograph of Knaresborough Viaduct over the River Nidd which was completed in 1851 and built through the picturesque town to carry a branch of the Leeds & Thirsk Railway. The four-span bridge stands 78ft high above the water, each span measuring 56ft 9in across. Circa 1851. Artist and lithographer are unknown. The Railway Station at Doncaster. An antique woodcut engraving which was published in "The Illustrated London News" on September 15th, 1848. Later coloured by hand. 'Great Western Railway - The Swindon Station', and 'New Swindon'. Two antique woodcut engravings which were published in "The Illustrated London News" on 18th October, 1845. Together with related text. New Grand Central Railway Station at Birmingham. An antique woodcut egraving which was published in "The Illustrated London News" on June, 3rd 1854. South Eastern Railway Station, London Bridge. An antique line engraving. Circa 1850 with later hand colouring. London & North Western Railway Station, Euston Square. An antique line engraving published in John Tallis Tallis's "Illustrated London 1851" with later hand colouring. The Metropolitan (underground) Railway - Works in progress at King's Cross. An antique woodcut engraving which was published in "The Illustrated London News" on February 2nd, 1861. 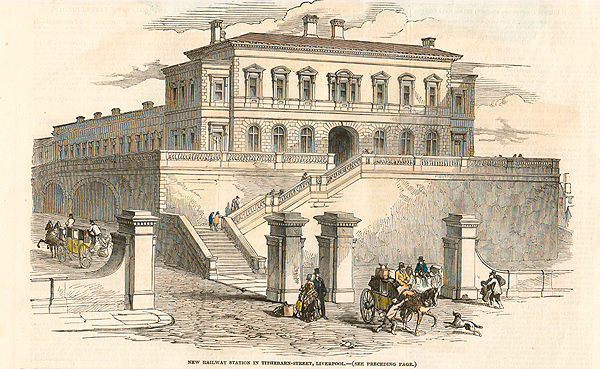 New Terminus Station of the Great Eastern Railway. Liverpool Street, City. An antique woodcut engraving which was published in a "Supplement to The Illustrated London News" on July 24th, 1875. The New Victoria Railway Station at Pimlico. 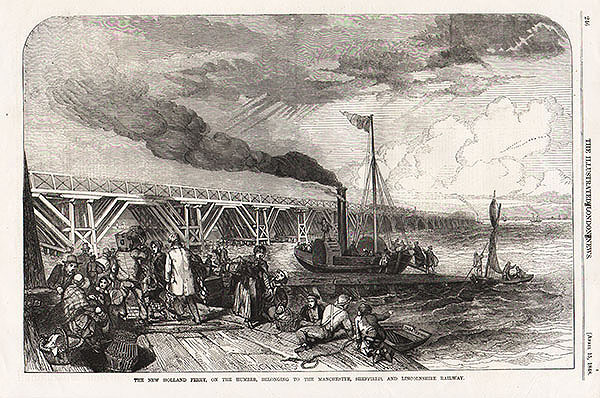 An antique woodcut engraving which was published in "The Illustrated London News" on May 4th, 1861. The colouring is later. London & Birmingham Railway Terminus, Euston Square. An antique line engraving by H. Bond after T.H. Shepherd. Circa 1840. An antique lithograph by Andrew Maclure and Archibald Gray Macdonald. Originally produced as a supplementary presentation plate to the part-work Cassell & Co. "Old and New London" (London : 1873-1878). Later coloured by hand. Chalk Farm Bridge, Birmingham Railway. An antique line engraving by J. Fussell. Circa 1840. Later coloured by hand. Underground London. At the busiest crossing in the World. A photograph of the Bank of England and the Royal Exchange accompanied by woodcut engravings of The Public suibway, The Central London Railway and the City and South London Railway. Published in "The Sphere2 on April 21st, 1900. 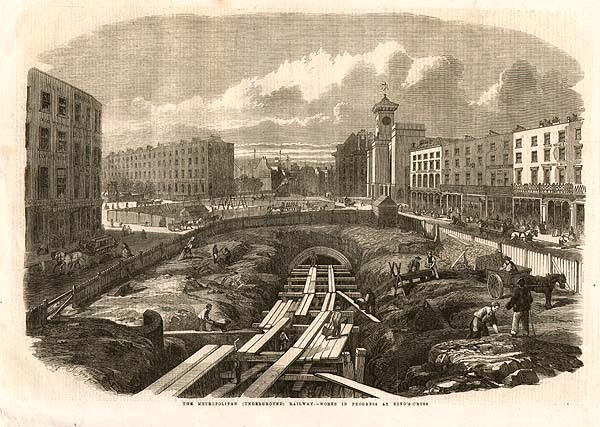 The Excavation near Camden Town. With the Stationary Engine Chimneys & Locomotive Engine House. An antique line engraving by H. Griffiths after E. Duncan. Circa 1840 with later hand colouring. 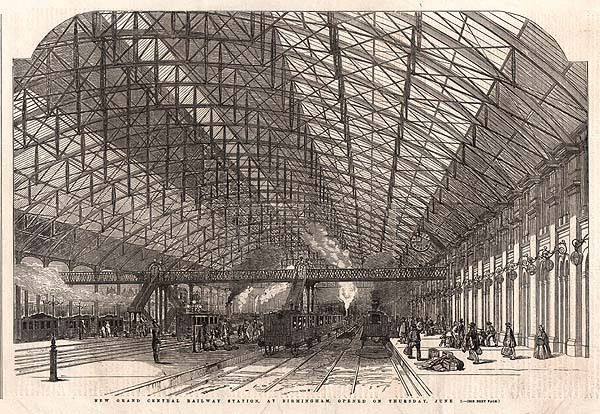 The Great Western Railway New Terminus, at Paddington. An antique woodcut engraving which was published in the "Illustrated London News" in 1854. The colouring is later. 'Eccentric for Shifting Railway, Locomotive Engine House and Chimnies of Stationary Engine House'. More Info An antique lithograph drawn and lithographed by J C Bourne of 'Eccentric for Shifting Railway, Locomotive Engine House and Chimnies of Stationary Engine House' at Camden Town on the London and Birmingham Railway. Printed by Day and Haghe, Lithographers to the Queen. Published by J C Bourne, 19 Lamb's Conduit Street, and Ackermann and Co, Strand, London. July 1838.Some surface dirt. An antique lithograph drawn and lithographed by J C Bourne of 'Eccentric for Shifting Railway, Locomotive Engine House and Chimnies of Stationary Engine House' at Camden Town on the London and Birmingham Railway. Printed by Day and Haghe, Lithographers to the Queen. Published by J C Bourne, 19 Lamb's Conduit Street, and Ackermann and Co, Strand, London. July 1838.Some surface dirt. Interior of the New Great Circular Engine-House at the Camden-Town Depot of the North Western Railway. An antique woodcut engraving which was published in "The Illustrated London News" in 1847. Later coloured by hand. More Info An antique lithograph drawn and lithographed by J C Bourne of 'Entrance to Locomotive Engine House, Camden Town' on the London and Birmingham Railway. Printed by C. Hullmandel. Published by J C Bourne, 19 Lamb's Conduit St and Ackermann and Co, Strand, London. 1839. 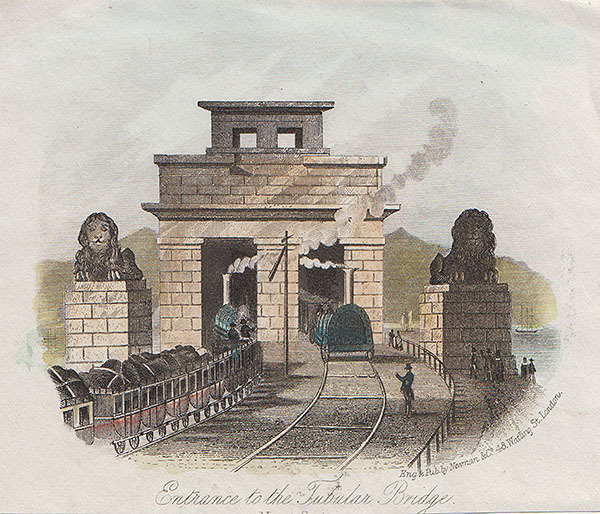 An antique lithograph drawn and lithographed by J C Bourne of 'Entrance to Locomotive Engine House, Camden Town' on the London and Birmingham Railway. Printed by C. Hullmandel. Published by J C Bourne, 19 Lamb's Conduit St and Ackermann and Co, Strand, London. 1839. New Stations of the Metropolitan Railway. 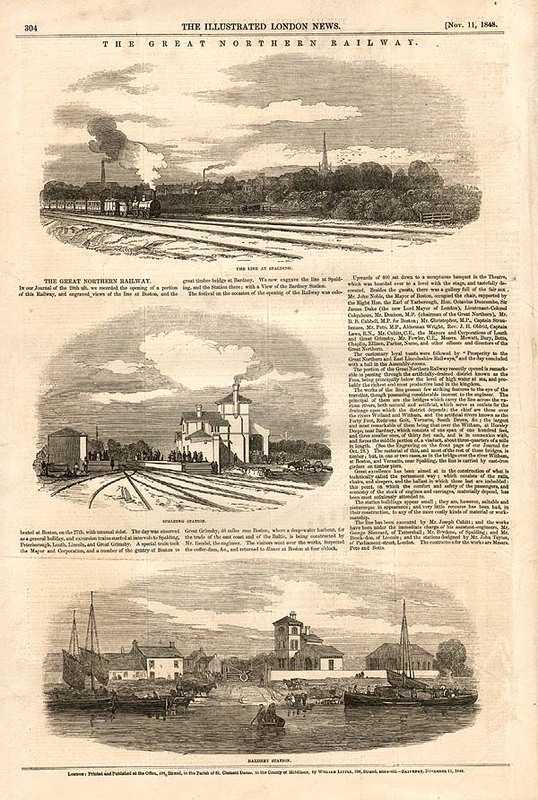 Two antique woodcut engravings, together with a report, which were published in "The Illustrated London News" on February 10th, 1866. Top view is of Aldergate Street and the lower is of Cowcross Street, Farringdon Road. Old Bridge and Railway Viaduct, Bath. An antique line engraving by Chas. Davies which was published by R.E. Peach, 8, Bridge Street, Bath. Circa 1860 witrh later hand colouring. An antique line engraving by Rock & Co. Circa 1860. View from above Kilsby Tunnel. July 10, 1837. More Info An antique lithograph drawn and lithographed by J C Bourne of 'View from above Kilsby Tunnel. July 10, 1837' on the London and Birmingham Railway. Published by J C Bourne, 19 Lamb's Conduit St and Ackermann and Co, Strand, London. 1839. 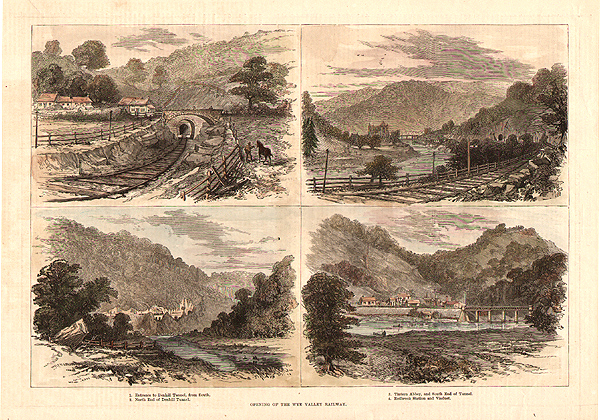 An antique lithograph drawn and lithographed by J C Bourne of 'View from above Kilsby Tunnel. July 10, 1837' on the London and Birmingham Railway. Published by J C Bourne, 19 Lamb's Conduit St and Ackermann and Co, Strand, London. 1839. More Info An antique lithograph drawn and lithographed by J C Bourne of 'Weedon Viaduct' on the London and Birmingham Railway. Printed by Day & Haghe Lithographers to the Queen. Published by J C Bourne, 19 Lamb's Conduit St and Ackermann and Co, Strand, London. 1839. 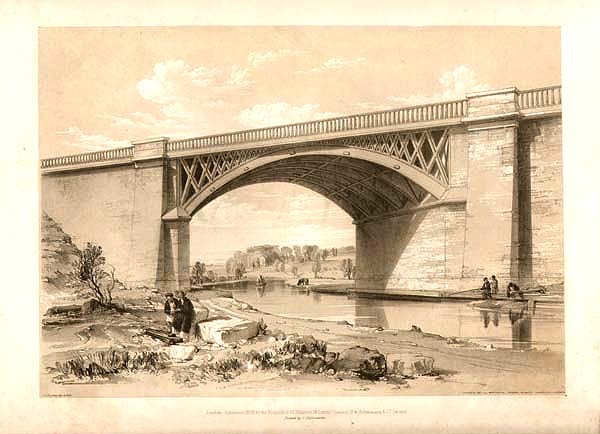 An antique lithograph drawn and lithographed by J C Bourne of 'Weedon Viaduct' on the London and Birmingham Railway. Printed by Day & Haghe Lithographers to the Queen. Published by J C Bourne, 19 Lamb's Conduit St and Ackermann and Co, Strand, London. 1839. Head Gear, Great Shaft, Kilsby Tunnel. More Info An antique lithograph drawn and lithographed by J C Bourne of 'Head Gear, Great Shaft, Kilsby Tunnel' on the London and Birmingham Railway. Published by J C Bourne, 19 Lamb's Conduit St and Ackermann and Co, Strand, London. 1838. Printed by C. Hullmandel. An antique lithograph drawn and lithographed by J C Bourne of 'Head Gear, Great Shaft, Kilsby Tunnel' on the London and Birmingham Railway. Published by J C Bourne, 19 Lamb's Conduit St and Ackermann and Co, Strand, London. 1838. Printed by C. Hullmandel. The Leicester and Hitchin Railway : Kettering Station. An antique woodcut engraving which was published in "The Illustrated London News" in 1857. Later coloured by hand. 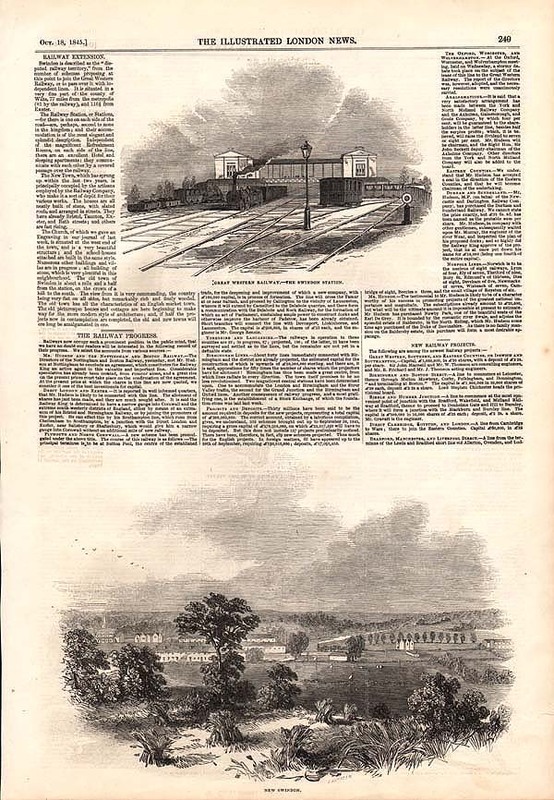 Three antique woodcut engravings and a report which were published in "The Illustrated London News" on November 11th, 1848. Engravings are of 1. The Line at Spalding. 2. Spalding Station. 3. Bardney Station. The First Locomotive passing Great Grimsby Church, on the Manchester, Sheffield and Lincolnshire Railway. An antique woodcut engraving which was published in "The Illustrated London News" on April 15th, 1848 with later hand colouring. The New Holland Ferry, on the Humber, belonging to the Manchester, Sheffield and Lincolnshire Railways. More Info An antique woodcut engraving which was published in "The Illustrated London News" on April 15th, 1848. The line up to New Holland was opened on 1st March 1848 with a through service from Louth. An antique woodcut engraving which was published in "The Illustrated London News" on April 15th, 1848. The line up to New Holland was opened on 1st March 1848 with a through service from Louth. 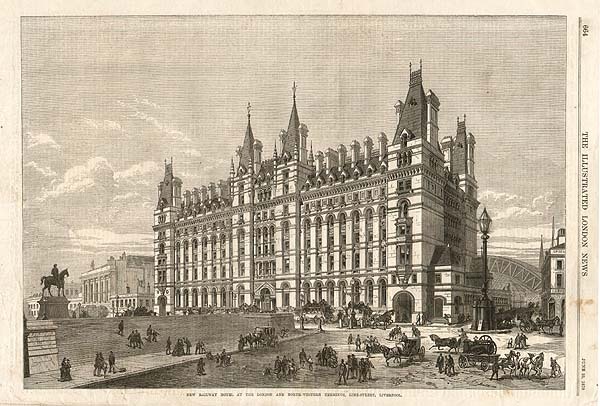 New Railway Hotel at the London and North West Terminus, Lime Street, Liverpool. An antique woodcut engraving which was published in "The Illustrated London News" on June 25th, 1870. New Railway Station at Tithebarn Street, Liverpool. An antique woodcut engraving which was published in "The Illustrated London News" on May 4th, 1850 with later hand colouring. 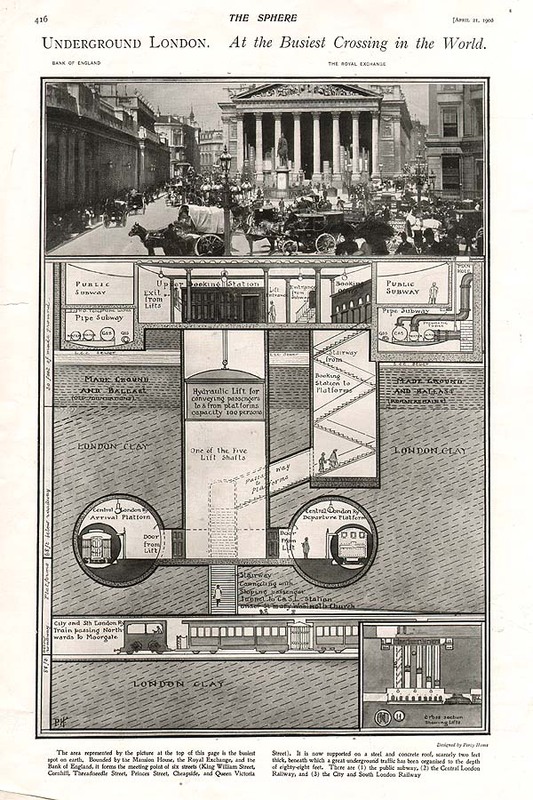 The Mersey Railway Tunnel : Plan and Section, and works in progress. More Info Antique woodcut engravings which were published in "The Illustrated London News" on June 11th, 1881. Views include 1. 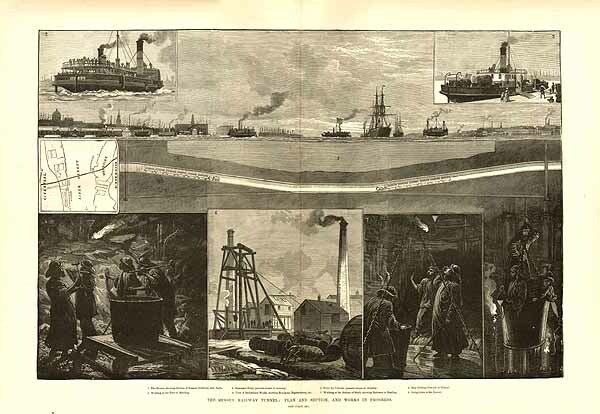 The Mersey, showing Section of Tunnel, Driftway, and shafts. 2. Passenger Ferry (present means of crossing). 3. Ferry for vehicles (present means of crossing) 4. Map showing Position of Tunnel. 5. Working at the Face of Heading. 6. View of Birkenhead Works, showing Headgear, Engine-house &c. 7. Working at the Bottom of Shaft, showing Entrance to Heading. 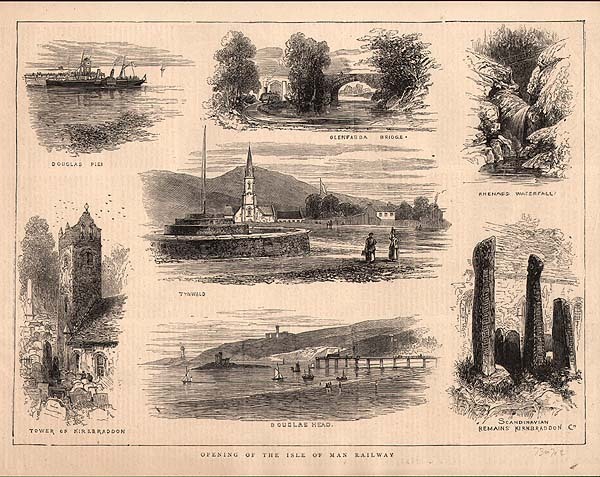 Antique woodcut engravings which were published in "The Illustrated London News" on June 11th, 1881. Views include 1. The Mersey, showing Section of Tunnel, Driftway, and shafts. 2. Passenger Ferry (present means of crossing). 3. Ferry for vehicles (present means of crossing) 4. Map showing Position of Tunnel. 5. Working at the Face of Heading. 6. View of Birkenhead Works, showing Headgear, Engine-house &c. 7. Working at the Bottom of Shaft, showing Entrance to Heading. An antique aquatint engraving by S.G. Hughes after T.T. Bury. Published by Ackermann & Co in 1833. Original colouring. Some staining to margins at both top corners caused by old tape. Wellington Crescent & Station, Ramsgate. An antique line engraving engraved and published by J. Newman & Co. 48, Watling St. London. Circa 1860. Later coloured by hand. London, Chatham & Dover Railway Station, Ramsgate. An antique line engraving engraved and published by Newman & Co. 48, Watling St. London. Circa 1860. Later coloured by hand. Sands & Railway Station, Ramsgate. An antique line engraving by Newman & Co, Watling St. London. Published & Sold by E. Knott, Stationer, Ramsgate. Circa 1860. Later coloured by hand. An antique line engraving, engraved and published by Newman & Co, 48, Watling St. London. Circa 1860. Later coloured by hand. 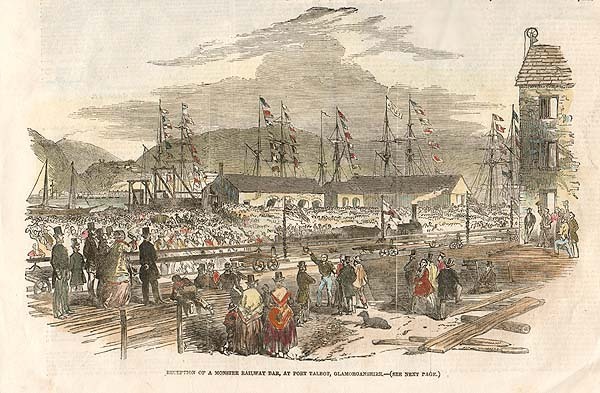 Opening of the Isle of Man Railway. 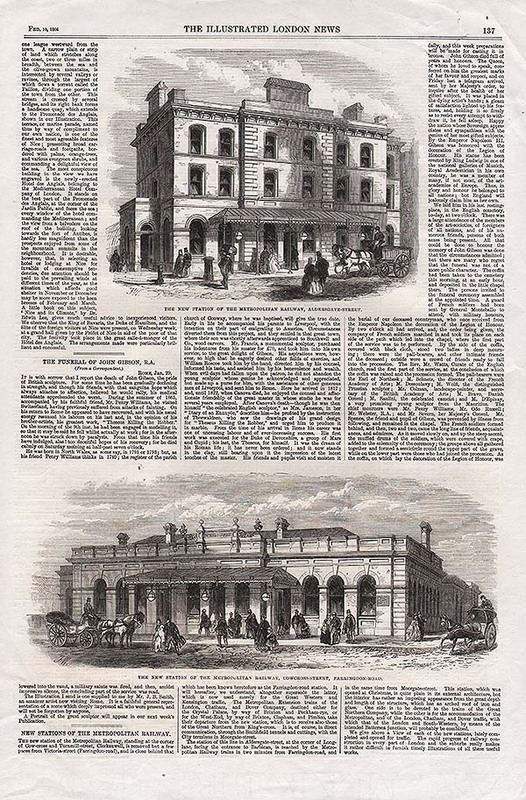 Antique woodcut engravings which were published in "The Illustrated London News" in 1873. Watford Tunnel Face. June 6th, 1837. More Info An antique lithograph drawn and lithographed by J C Bourne of 'Watford Tunnel Face. June 6th, 1837' on the London and Birmingham Railway. Printed by Day & Haghe Lithographers to the Queen. Published by J C Bourne, 19 Lamb's Conduit St and Ackermann and Co, Strand, London. 1838. Two small marginal tears 2cms from printed area. An antique lithograph drawn and lithographed by J C Bourne of 'Watford Tunnel Face. June 6th, 1837' on the London and Birmingham Railway. Printed by Day & Haghe Lithographers to the Queen. Published by J C Bourne, 19 Lamb's Conduit St and Ackermann and Co, Strand, London. 1838. Two small marginal tears 2cms from printed area. Box-Moor Embankment. June 11th, 1837. More Info An antique lithograph drawn and lithographed by J C Bourne of 'Box-Moor Embankment. June 11th, 1837' on the London and Birmingham Railway. Printed by Day & Haghe Lithographers to the Queen. Published by J C Bourne, 19 Lamb's Conduit St and Ackermann and Co, Strand, London. 1839. 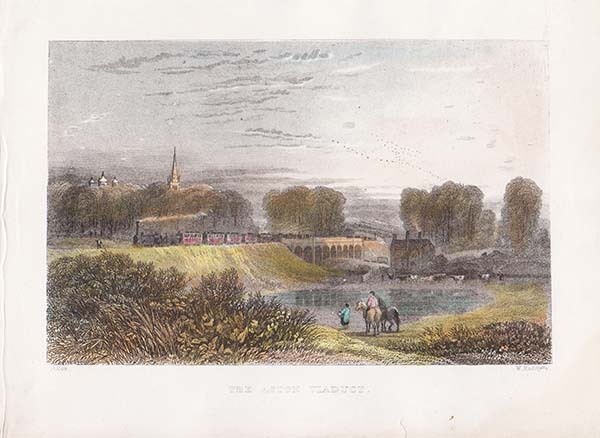 An antique lithograph drawn and lithographed by J C Bourne of 'Box-Moor Embankment. June 11th, 1837' on the London and Birmingham Railway. Printed by Day & Haghe Lithographers to the Queen. Published by J C Bourne, 19 Lamb's Conduit St and Ackermann and Co, Strand, London. 1839. Nash Mill Bridge, near Kings Langley, Herts. More Info An antique lithograph drawn and lithographed by J C Bourne of 'Nash Mill Bridge, near Kings Langley, Herts.' on the London and Birmingham Railway. Printed by Day & Haghe Lithographers to the Queen. Published by J C Bourne, 19 Lamb's Conduit St and Ackermann and Co, Strand, London. 1839. An antique lithograph drawn and lithographed by J C Bourne of 'Nash Mill Bridge, near Kings Langley, Herts.' on the London and Birmingham Railway. Printed by Day & Haghe Lithographers to the Queen. Published by J C Bourne, 19 Lamb's Conduit St and Ackermann and Co, Strand, London. 1839. 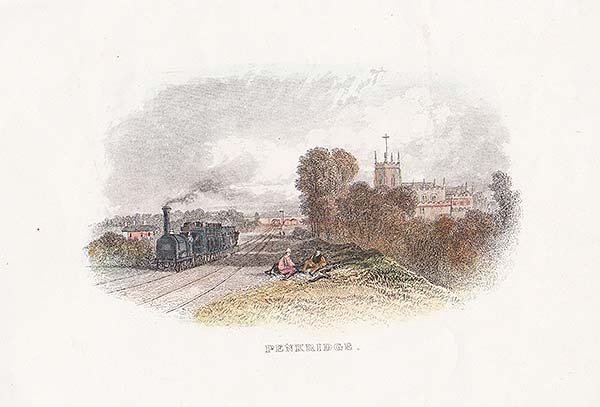 The Ross, Hereford and Gloucester Railway - The Town of Ross. An antique woodcut engraving which was published in "The Illustrated London News" on July 14, 1855. An antique line engraving by J. & F. Harwood. Circa 1841. Later coloured by hand. Portland. The Castle & Railway Station. An antique line engraving by Newman & Co. 48, Watling St. London. Published by B. Benson, Bookseller, Weymouth. Circa 1860. Later coloured by hand. The Meldon Viaduct, Devon and Cornwall Railway. An antique woodcut engraving which was published in the "Illustrated London News". Circa 1875. The colouring is later. 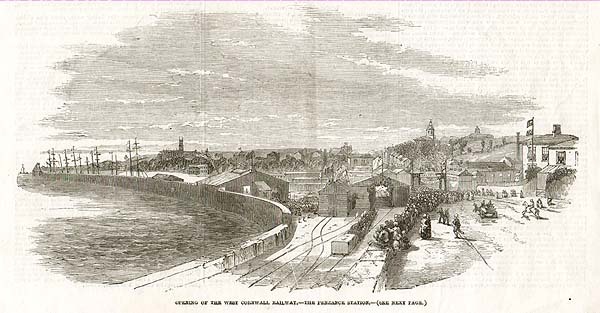 Opening of the Exeter and Exmouth Railway : Arrival of the first train at Exmouth. An antique woodcut engraving which was published in "The Illustrated London News" in 1861. Opening of the West Cornwall Railway - The Penzance Station. An antique woodcut engraving which was published in "The Illustrated London News" on 4th September, 1852. 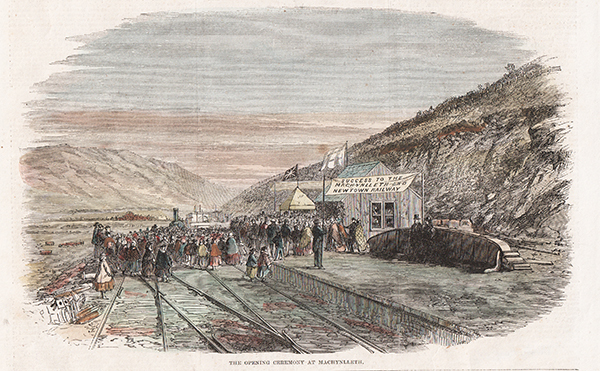 Opening of the Cornwall Railway. 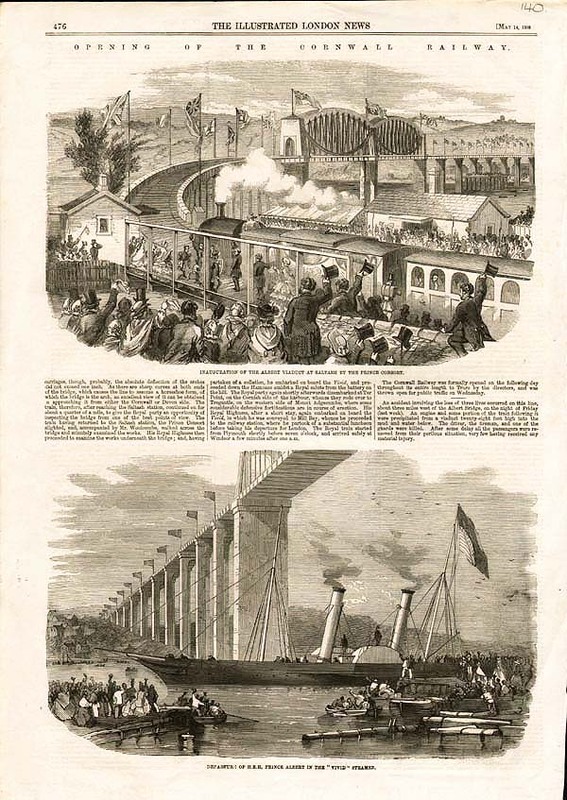 Two antique woodcut engravings which were published in "The Illustrated London News" on May 14th, 1859. The top engraving is "Inauguration of the Albert Viaduct at Saltash by the Prince Consort" and the bottom is "Departure of H.R. H. Prince Albert in the "Vivid" steamer. An antique line engraving by A. Ashley after J. F. Burrell. Drawn and engraved for the British Gazetteer. It has been coloured by hand. 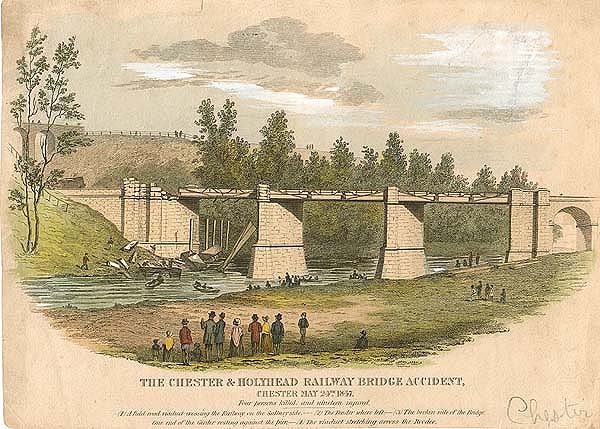 The Chester & Holyhead Railway Bridge Accident, Chester May 24th, 1847. 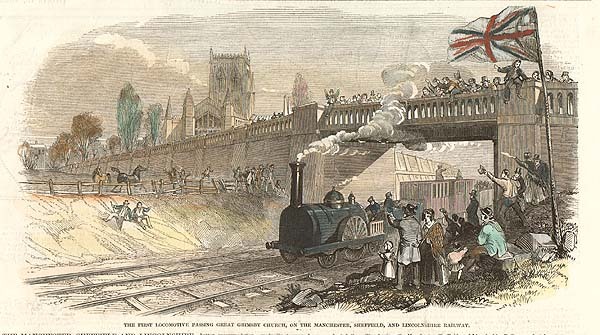 More Info An antique line engraving depicting the scene at Chester after the accident where four persons were killed and nineteen were injured. Beneath the title, the text, which includes a key which describes the devastation. Circa 1850. Later coloured by hand. Repaired tears in top right corner of image. An antique line engraving depicting the scene at Chester after the accident where four persons were killed and nineteen were injured. Beneath the title, the text, which includes a key which describes the devastation. Circa 1850. Later coloured by hand. Repaired tears in top right corner of image. The Eastern Counties Railway - Opening of the line to Cambridge and Ely. Five antique woodcut engravings which were published in "The Illustrated London News" on August 2nd, 1845. They include views of the railway stations of Elsenham, Chesterfield, Cambridge, Wendon and Ickleton. More Info An antique lithograph drawn and lithographed by J C Bourne of 'Woolverton Viaduct' on the London and Birmingham Railway.. Printed by Day and Haghe, Lithographers to the Queen. Published by J C Bourne, 19 Lamb's Conduit St and Ackermann and Co, Strand, London. 1838. An antique lithograph drawn and lithographed by J C Bourne of 'Woolverton Viaduct' on the London and Birmingham Railway.. Printed by Day and Haghe, Lithographers to the Queen. Published by J C Bourne, 19 Lamb's Conduit St and Ackermann and Co, Strand, London. 1838. More Info An antique lithograph drawn and lithographed by J C Bourne of 'Blisworth Cutting' on the London and Birmingham Railway. Printed by Day & Haghe Lithographers to the Queen. Published by J C Bourne, 19 Lamb's Conduit St and Ackermann and Co, Strand, London. 1839. 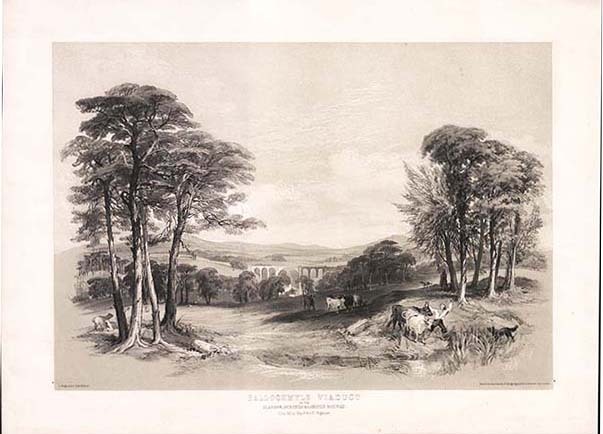 An antique lithograph drawn and lithographed by J C Bourne of 'Blisworth Cutting' on the London and Birmingham Railway. Printed by Day & Haghe Lithographers to the Queen. Published by J C Bourne, 19 Lamb's Conduit St and Ackermann and Co, Strand, London. 1839. An antique lithograph drawn and lithographed by J C Bourne of 'Nash Mill Bridge, near Kings Langley, Herts.' on the London and Birmingham Railway. Printed by G. Hullmandel. Published by J C Bourne, 19 Lamb's Conduit St and Ackermann and Co, Strand, London. 1839. An antique lithograph drawn and lithographed by J C Bourne of 'Canal Bridge, Pitstone, Bucks' on the London and Birmingham Railway. Printed by Day & Haghe Lithographers to the Queen. Published by J C Bourne, 19 Lamb's Conduit St and Ackermann and Co, Strand, London. 1839. An antique lithograph drawn and lithographed by J C Bourne of 'Jackdaw Hill, Linslade, Bucks' on the London and Birmingham Railway. Printed by Day & Haghe Lithographers to the Queen. Published by J C Bourne, 19 Lamb's Conduit St and Ackermann and Co, Strand, London. 1839. 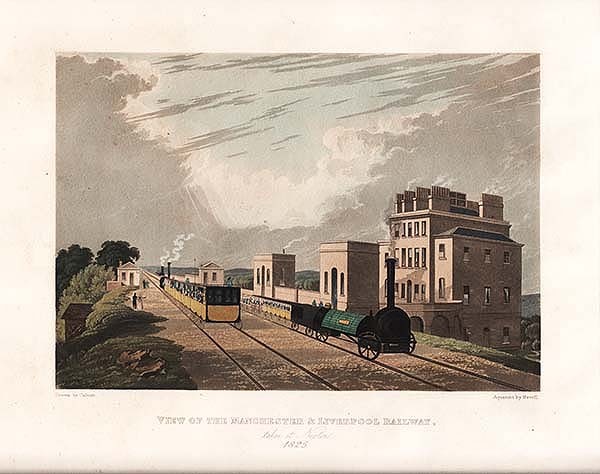 An antique lithograph drawn and lithographed by J C Bourne of 'Making the Embankment, Wolverton Valley, 28 June 1837' on the London and Birmingham Railway.. Printed by Day and Haghe, Lithographers to the Queen. Published by J C Bourne, 19 Lamb's Conduit St and Ackermann and Co, Strand, London. 1838. An antique line engraving by W. Radclyffe after C. Radclyffe. Circa 1840 with later hand colouring. More Info An antique lithograph drawn and lithographed by J C Bourne of 'Pumps for draining the Kilsby Tunnel' on the London and Birmingham Railway. Printed by Day & Haghe Lithographers to the Queen. Published by J C Bourne, 19 Lamb's Conduit St and Ackermann and Co, Strand, London. 1839. An antique lithograph drawn and lithographed by J C Bourne of 'Pumps for draining the Kilsby Tunnel' on the London and Birmingham Railway. Printed by Day & Haghe Lithographers to the Queen. Published by J C Bourne, 19 Lamb's Conduit St and Ackermann and Co, Strand, London. 1839.